Meet this adorable little mousekin that looks like an expert tailor in this meticulous embroidery design! 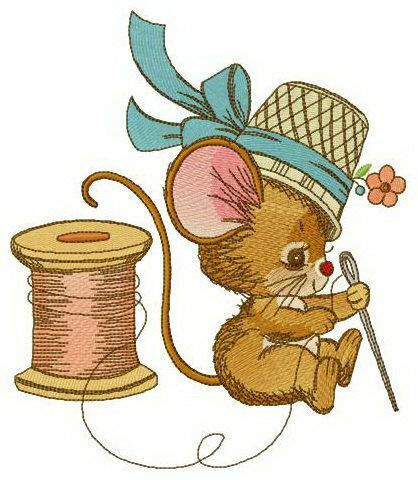 The beige mouse is all set to start sewing – it has a spool of thread and a needle at hand. The funny little guy also has a thimble decorated with a blue ribbon and a flower perched on his head which looks like a stylish top hat. The sixteen-color palette is soft and cozy ranging from almond and bisque to turquoise and sand dune. You can use this creative needlework to enhance any items of your choice, for example sewing bags, linen, towels, pajamas, sweaters, blankets, quilts, etc. Works nicely with all fabrics ! Earn 725 points for purchasing this product.